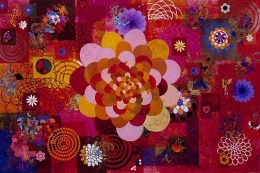 James Cohan Gallery is pleased to present Summertime, an exhibition of new works by Beatriz Milhazes. The exhibition includes five large-scale paintings and three collages in which Milhazes celebrates her native Brazil and the culture of carnival, with all of its resplendent color and vibrancy. Over the last decade, Milhazes has engaged in an ongoing dialogue between the ornate and unadorned, geometric and organic, high and low culture. It is the foundation of her work. Her unabashed use of color and pattern is balanced by harmonious and lyrical compositions. 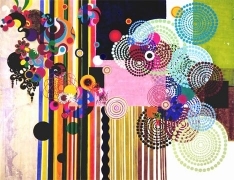 In Pacaembu (2004), concentric circles of beads play against flat squares of color, while vertical bands converse with whimsical ornament. Milhazes intentionally places chaos and order in direct contrast, with melodious results. 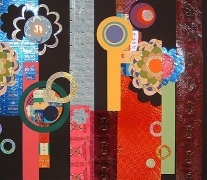 The microcosms that Milhazes creates in each painting and collage are a central structure in her work. Within each detail is a visual episode, a world unto itself. She applies decorative and symbolic patterns appliqué fashion, overlapping and layering images at will, encouraging the viewer to savor both individual elements and entire compositions. The iconography of creation is ever-present, as in Phebo (2004) where a magnificent central flower gives way to ripe fruits and flowers, butterflies and birds, peace signs and hearts- a whimsical tableau of paradise. Milhazes is thoughtful about the titles of her works. While 'Summertime' sets a festive tone for the exhibition, paintings titled Perquita (Little Parrot) (2004) and Mariposa (Butterfly) (2004) truly enhance it. The Catholic tradition of Brazil is linked to this idea of creation, which Milhazes references in Santo Cristo (2004), the only strictly vertical painting in the exhibition, where organic images scroll upward against a geometric background, suggesting a 'tree of life'. Milhazes' work embraces the vibrant culture of Brazil, conflating exhibitions and present. Her paintings and collages instantly captivate with their sensuous, colorful rhythms and dazzling imagery, seducing the viewer into a world of celebratory delight. 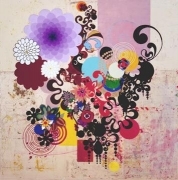 Beatriz Milhazes was born in Rio de Janeiro in 1960, where she lives and works.